These ham casserole recipes are a big hit with everyone at potlucks and the whole family. Ham casseroles work great when you have leftover ham from holidays or just love ham like we do. Whether it is for breakfast or dinner lots of ingredients go well with ham such as broccoli, noodles, rice, eggs and potatoes so you can change up your recipe easily. Here are several of our top ham casseroles. 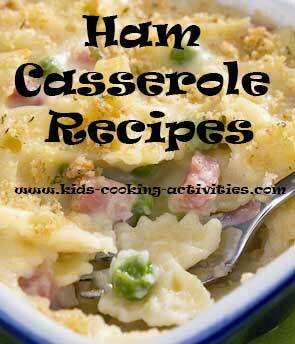 Do you have a favorite casserole recipe with ham? Share it below. Prepare cream soup below first and allow to cool. Saute 1/4 cup onions in 2 Tablespoons butter. Season with salt and pepper. Peel 5-6 medium potatoes and dice. 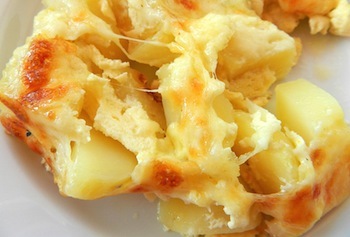 Add potatoes to casserole dish. Season with salt and pepper. Sprinkle with 1/2-1 Cup shredded cheese. Toss 1 -2 Cups diced ham and stir to combine. Pour cream chicken sauce over top. Cook at 350 degrees for 40 minutes or until tender. Sprinkle with stuffing 10-15 minutes before done. 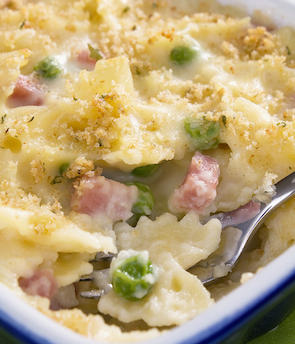 Kids can help peel potatoes and add in ingredients for any of these ham casserole recipes. You can change your noodles easily in this recipe by using whatever shape or type you have on hand. Our favorite is using frozen tortellini but we don't have that on hand often. If you'd like to change the recipe cook noodles as you would normally, drain and mix all your ingredients together. Boil water and add frozen tortellini and broccoli. Cook until both are tender. Meanwhile make a basic white sauce. Drain noodles and broccoli. Place inside casserole dish or back into drained pot. Add chopped ham. Pour white sauce over the top. Stir to combine. Serve immediately. Melt butter. Whisk in flour making a roux. Whisk in milk and seasonings. Simmer until thickens. Learn how to make a white sauce here.